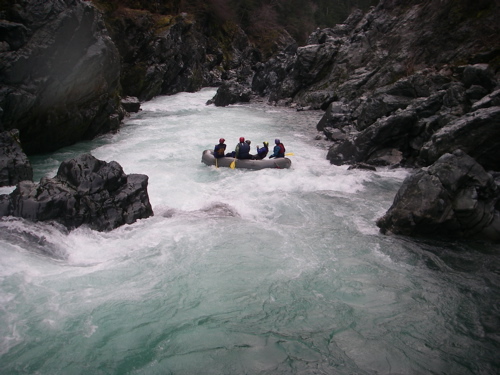 Last weekend, ten All Outdoors guides met up in (very far) Northern California for a weekend of whitewater rafting on the Smith River. 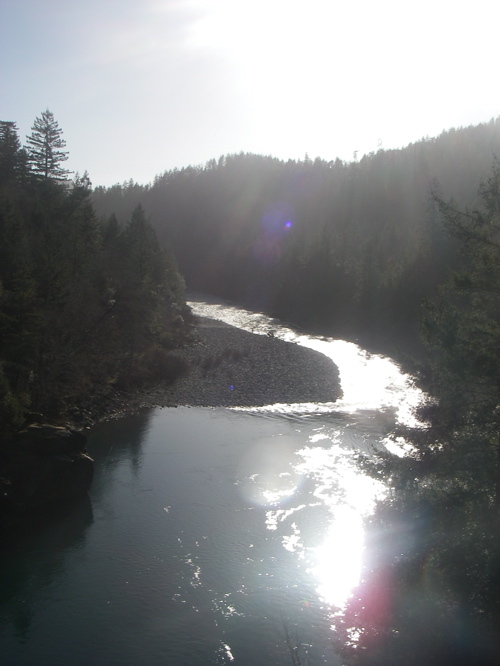 The Smith is one of the only un-dammed drainages remaining in California, beginning its course high in the Siskiyou Mountains, and flowing strong and steady all the way into the Pacific Ocean near Crescent City. This makes a rafting trip on the Smith unique in several ways. 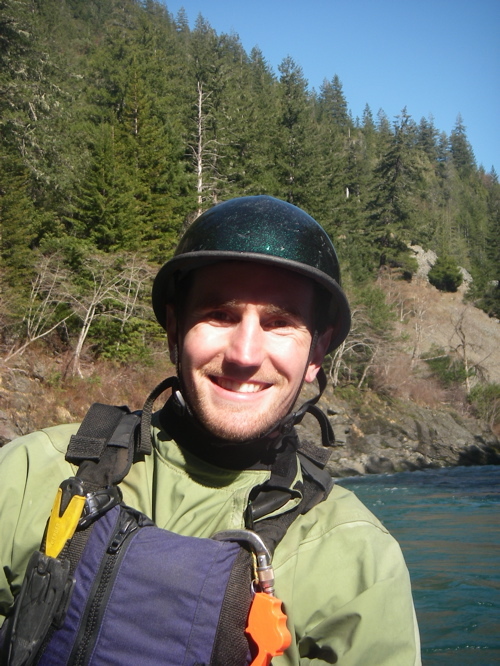 For one, the river is also a popular fishing run because anadromous (e.g. salmon) populations still thrive in its open, untouched waterways, creating a very interesting mix of hardened fisherman and “crazy” rafters having to coexist on the river’s banks. Who knows what those guys are thinking when we show up in our pink, yellow and green drysuits, sparkling helmets, and similarly colorful boats! Suffice it to say, we get some interesting stares up there. 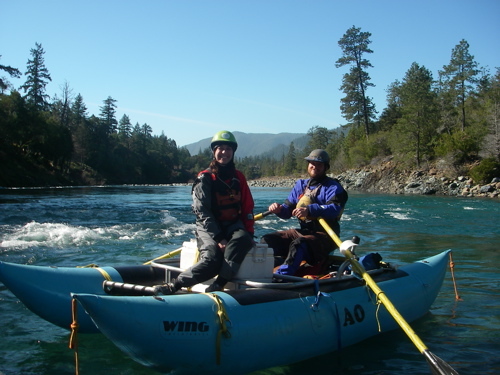 The Smith is also unique in that it is one of the only rivers in California (worth rafting on), which allows you to enjoy moonlit walks on the beach in between days of rafting. OK, maybe moonlit walks on the beach isn’t exactly what we were doing. More like good seafood and beer at a harbor restaurant. Either way, the ability to smell and soak in both the forest and the ocean in one day is pretty amazing. 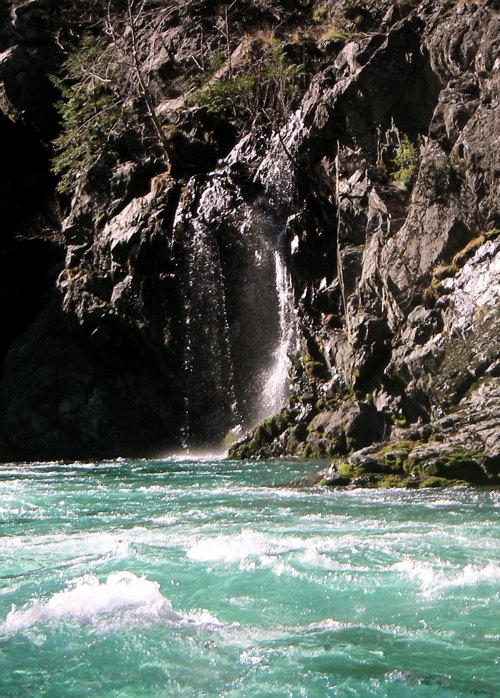 The Smith itself is one of the most beautiful rivers around, with bright blue water, towering redwoods, waterfalls, and moss-covered canyon walls. We ran three different sections of the river over the course of three days, a few of which we had so much fun on that we decided to do them twice. This is another wonderful thing about the Smith- many of its runs are close to the highway and short, allowing you to play around on several different gorges and run things over again over the course of the day. 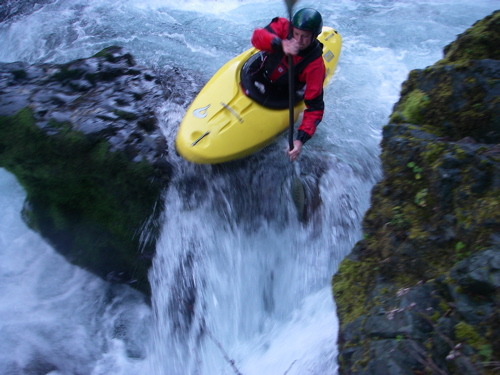 The first day we stuck to the Middle Fork and its lower Oregon Hole Gorge. It was a nice few miles of Class II, followed by a mile of Class IV to end the day. Oregon Hole Gorge turned out to be a lot of fun, with three big rapids and a lot of sizable, yet runnable, holes. We drove back to Crescent City with plenty of time for a soak in the hot tub at our hotel, and a few hours of pizza and pool at a local restaurant. (Yes, we were truly roughing it out there this time.) The pizza place is actually worth mentioning. The food was pretty good, and, more importantly, we had the entire bar to ourselves…. literally. Turns out the bartender really wanted to watch a boxing match being broadcast on his buddy’s TV, so he made us promise not to steal anything, and then left! It was amazing. We lined up a list of some good classic songs on the Jukebox (think Friends in Low Places and Every Rose Has its Thorn), and got to be loud and silly without worrying about scaring anyone. Day two we decided, despite warnings on Dreamflows that there was still plenty of snow on the ridge road to put-in, to try and get to the North Fork of the Smith. A little bit of background on this: the drive to the put-in for the North Fork is about an hour long. It is one of the most scenic drives to a river put-in I’ve ever experienced, climbing up and along a ridge that separates mountains in the East from coastline in the West. However, this also means that it is a little bit higher in elevation, which meant, for our purposes, snowier. And it turned out, those guys posting on Dreamflows weren’t lying. We eventually hit a patch of snow on the road that was extremely icy, and about 1 foot deep. It was so sad… we had already made it to within five miles of the put-in. We played around with Steve’s big Chevy truck for a while, making inroads of about 3 to 6 feet with every accelerated run at it, thinking maybe we could just will ourselves the rest of the way there. Several of the guys even started getting behind the truck while Steve was driving, trying to help push it through the snow. But eventually we had to accept the inevitable, and turn around. What started as a bit of a bummer, though, turned into a really fun day. 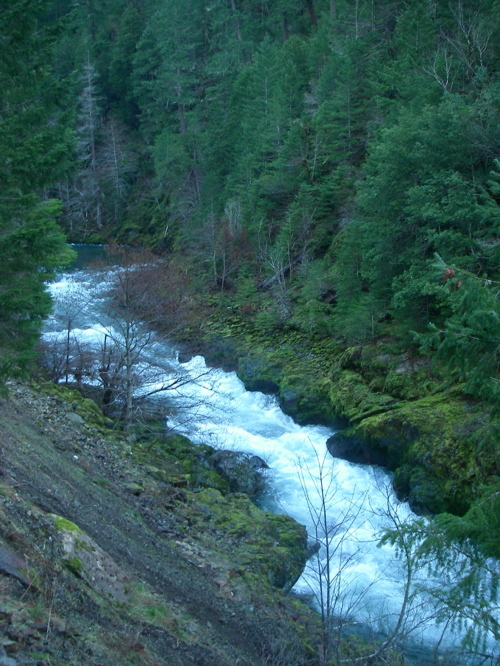 We warmed up with a repeat run on the Oregon Hole Gorge, and then turned our sights on the more difficult South Fork Gorge. Of the three gorges we did (one of which I have not yet talked about), the South Fork was my favorite. 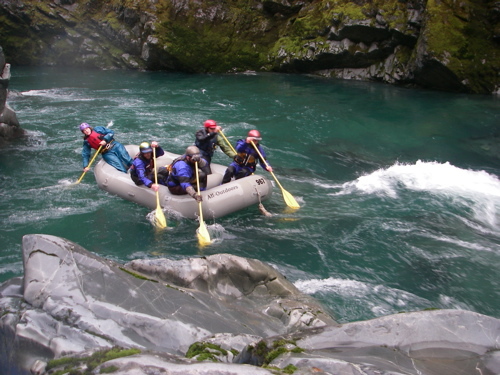 Rapids were significant and big, but with clear lines and enough room to maneuver. And the feel of the place is much more like a true gorge, with steeper and taller walls than the Middle Fork. Turns out everyone else really liked it to, because once we got to take out we decided to drive 1.5 miles up the road and run it again. 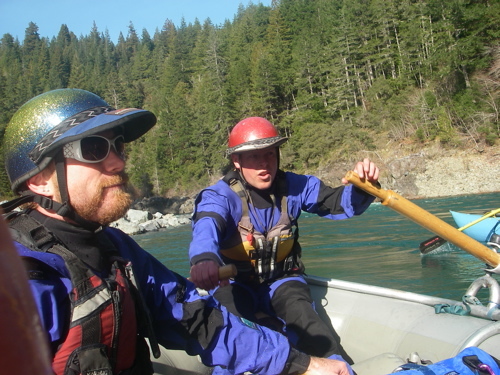 On the last day, a smaller group of us (only six) took the smallest boats we had with us to run the Siskiyou Gorge on the Middle Fork. 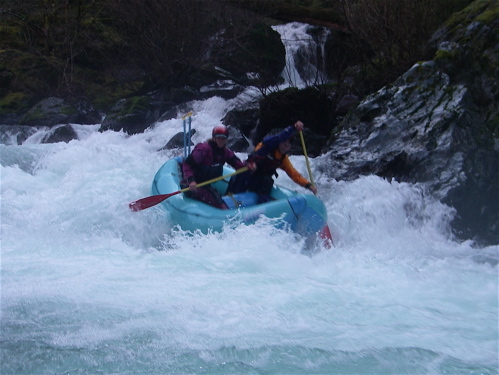 This is higher up in elevation than the Oregon Hole Gorge, and was the most challenging whitewater of the trip with a few Class IV+ rapids requiring a lot of technical maneuvering. It was a different kind of fun from the South Fork Gorge; long scouts, butterflies in my tummy, and one port age for the hard-shell kayaks. 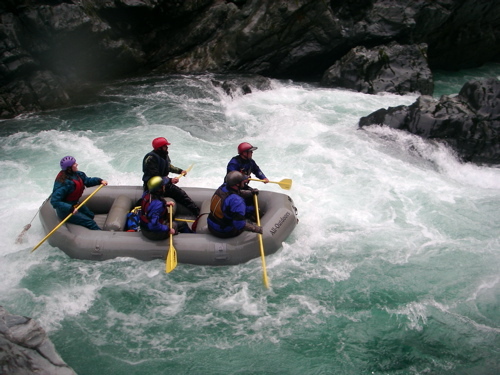 The inflatable boats, (an inflatable kayak and small 10-foot, two person raft) were able to run all the rapids. There were a few close calls, however, with Heather and I almost flipping right beside an undercut rock at one point. It was great to end the trip with a challenge like that, and even though the South Fork Gorge was our favorite, we all agreed we had some unfinished business with the Siskiyou Gorge. We all are itching to get back there so we can clean up our lines a little bit with the lessons we learned this time! I tried to put pictures up in this entry where they were relevant. All in all it was an incredibly fun weekend, and got me even more excited for when all of us AO folk get to raft together again every week, rather than once a month. 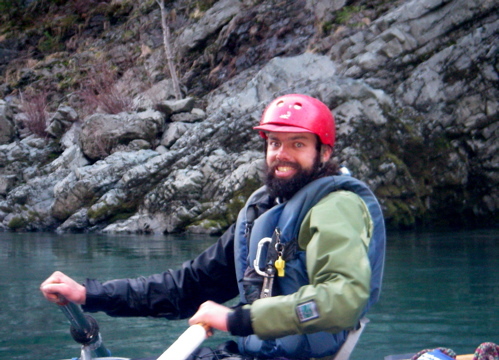 Reading this adventure story about the Smith River brings back such fond memories of my own Smith River trip. It’s too bad you guys didn’t get to see the North Fork as that was my favorite run (although we didn’t do the South Fork). We ran the North Fork of the Smith at near flood stage. I’m not sure of the cfs but the gauge at put-in was reading about 14 feet. It rained non-stop and we were just below the snow line so it was freezing. We had a raft flip on a monstrous wave and it took quite sometime to retrieve paddles and people as there were no eddies. 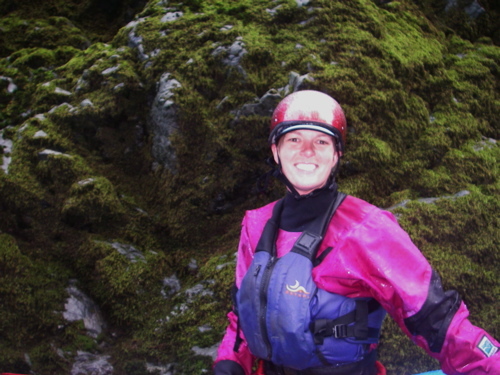 The paddlers had to climb on to walls to get out of the river, only to jump back in because the rafts were headed downstream….so glad I was in the boat that decided to paddle harder after seeing how big the wave was next to the raft! I hope I will see the Smith River again, it is a beautifully unique river, worth every moment to be there.